Problems with morale in the workplace are more obvious now. Employees are worried about the economy and possibly their jobs. Let us assume for this article that economic worries are not the reason for low morale in your workplace. I wrote an article a few months ago called “Tough Times Call For Strong Leadership” that addresses that issue. There are any number of reasons low morale can creep into the workplace. Regardless of the reason low morale can hurt productivity, increase work errors, increase “sick days”, decrease cooperation between teams and departments, and if left unchecked can lead to larger problems. Clearly morale is an emotional issue with employees. Most employees are good workers. They show up on time each day, do well at their job, and take home the satisfaction that they have done a good days work. They feel they belong to a group that works just as hard as they do and they work for a company and management that cares about them. This is the ideal of good morale. Poor Leadership – This is at the top of the list because it is usually the main problem. A lack of morale in the workplace means a leader or manager has not addressed the issue that caused it. It might be their management style or they just don’t get it. Unhappy In Their Present Position – Most employees have hopes of moving up in an organization. They may want more money, or more challenging work. The employee may like the position they are in, but they feel they are underutilized. No Clarity in Expectations – Employees want to know what is expected of them. They may become distressed that they are not meeting expectations which they know will hurt them on their performance review. This problem is caused by managers who have not taken the time to give clear expectations of the position. Other Employees – This is where the saying “one bad apple can spoil the whole bunch” applies. When management fails to deal with an underperforming employee it can quickly spread negativity among the entire staff. This can be a bad problem with teams who are dependent on one other. There are many other reasons for low morale in the workplace. As a manager or leader if you have an issue with morale, you must immediately seek out the source and deal with it. To deal with morale issues you must first find the source and take steps to make sure it does not creep back in. Throwing a pizza party may raise morale for a day, but it does not address the issues. No type of “feel good” activity will solve this problem. When morale is low employees may not express it but they are waiting on management to solve the problem. I listed the first cause of low morale as poor leadership. Too often managers are disconnected from their employees or do not give them the affirmation that they need. Remember morale is an emotional issue. Employees need to know their work is appreciated. They want to have the sense that they belong, that they are respected and have the respect of their peers and management. The best motivator is to make people feel that they are a valuable and worthy person and a valuable and worthy member of the team. Here are ways to do this. Employees need to feel there is a connection between themselves and management. That they share a common purpose and common goals. They need to know that management knows who they are, what is going on with their job and that management is their to help them when needed. One-way to connect with your employees is to spend time with them. You should regularly work along with them if possible. If not then take some time and find a reason to sit with them at their desk. Perhaps to check something they are working on or just to stop in and see how they are doing. You MUST be sincere about this. See if there are any issues they are having that you can help with. Take your lunch or breaks with your employees. It helps show you do not consider them beneath your association. It also gives you an opportunity to have a conversation that is not work related. This goes a long way towards maintaining the connection you need. Another way to connect with your employees and with the workplace is to do a daily Gemba walk. This is where you go to where the work is being done and observe and interact with your employees. You can read more about taking a Gemba walk in this earlier article “Why Management Should Go to Gemba”. Employees want recognition and acknowledgment that their work has purpose and that it is appreciated. Never miss an opportunity to recognize when someone has done good work. Even a simple “Thank You” when an employee completes a task for you will help them see their work is appreciated. Recognize how the contributions of your employee have helped you get your job done. “Thank you for all of your hard work gathering this information. It will allow me to get my budget turned in on time.” This shows the employee how valuable their work is directly to you. Recognize how the contributions of your employee has helped your company. “Thank you for all of your hard work on this project. We will save a lot of money because of your efforts.” This shows the employee how valuable their work is to the company. Recognition must be sincere to do any good. Do not pass out remarks for any reason. If your employee has worked hard on something and done a good job, they almost expect to be recognized for it. It affirms that their work is appreciated and that you respect the work that they do. Awards and public recognition of work above and beyond are excellent ways to recognize the hard work of your employees. All employees want recognition from management and their peers. You may also benefit from the increased performance of others so they also can get an award. The drudgery of doing the same thing, day after day, year after year can cause a good employee to suffer low morale over time. While the employee may be filling a vital role in the work that they do, they probably will appreciate a new challenge or task. As managers we are trained to delegate. See if there is a task you can delegate to one of your employees. Explain to them how important the task is and that because of their performance you have confidence in their ability to do it. It can be something as simple as preparing a report. Another way to challenge your employees is to take an active role in their career development. While most of us do not want to lose hardworking employees, they should be given opportunities to advance themselves. Offer them training or teach them new skills. Sit down and talk with them about their career path. This shows you care about them improving themselves and are willing to help them. Even if they do not move on to another position, you will end up with a more skilled employee who is more confident about their abilities and their value to the company. Problem or under performing employees can drain morale faster than anything. You must always take immediate action to deal with such issues before they become larger ones. 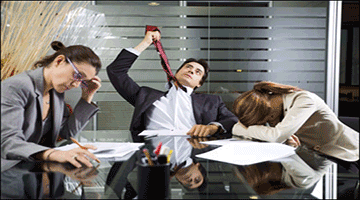 Use progressive discipline to deal with problem employees. Check their progress with regular follow-up meetings. If after following the steps of progressive discipline the issues have not be resolved, terminate for the good of the employee, yourself, the company and colleagues. One of the problems you will face is that if you discipline in private like you should, other employees may not even be aware you are working to correct the problem. To deal with this issue and still respect the privacy of the employee hold team meetings to discuss the issues being dealt with in general. Do NOT make it obvious that you are talking about the specific employee. For instance if it is an attendance issue, hold a meeting and go over the attendance policy. Do it as part of a meeting on other matters such as a project update. You benefit in that you are being consistent and treating all employees the same on the issue. Indirectly and with respect to the privacy of the person, it shows that you are taking notice of attendance issues. Sometimes low morale can be a sign of a dysfunctional system. If you have policies that are nearly impossible for the employee to follow, or are so strict they live in constant fear of losing their job, you have a system in place that can kill morale. For instance a strict attendance policy that states if you are late 5 times in a 3-month period you will be terminated you have a system that places little value on the employee. Yes attendance is important, but life happens. Employees may get stuck in traffic, or forget to set their alarm. There are any number of legitimate reasons that can cause an employee to be late. You do NOT want your employees driving like a maniac to get to work on time out of fear of losing their job. High stress equal low morale. Employees also must know what is expected of them. Job expectations should be made clear so the employee knows what their job role and responsibilities are. Don’t just verbally tell them, write them down and give it to them. During performance reviews it is the perfect time to review and update expectations. How will you employee know if they are doing a good job if you never tell them what is expected of them? The work environment is vital to employee morale. Is your workplace clean? Is the furniture and equipment functional? Is your workplace drab and dreary? If you want good morale not to mention better performance consider improving the work environment. Does management sit in new offices using the newest technology, while employees have broken chairs and outdated computers? Does your system, polices and work environment create a compelling place for your employees to work? Or is it so strict and outdated that they dread coming in? Most morale issues are not problems for the employee to address. They are problems that management and leadership have not addressed. Low morale in the workplace is an emotional issue for employees. It has many causes and must be dealt with immediately. Often poor leadership or poor management is the problem. Take steps to directly connect with your employees. Let your employee know you do know who they are, the work that they do and that you are always there to help them. You should always recognize when they do good work, preferably in a public way. A simple “Thank You” for a job well done is recognition that you appreciate their work. Employees need to know their work has a purpose, is appreciated and that both management and the company value them. You must deal with problem employees before they infect them entire group. Use progressive discipline and follow-up regularly to go over the progress. Examine your system, policies and work environment. These could all be sources of low morale. If you take nothing else away remember employees must feel that they are a valuable and worthy person and a valuable and worthy member of the team. I think the best way to create a positive work environment is to be happy and content with what you have. I am not saying you give up your dreams, I’m saying be happy. That’s that. Go and find a workplace that can benefit you, but as for now, be happy. People are motivated and have a high morale when they start working. Just keep it that way and don’t put them down all the time. Give them freedom and an opportunity to grow. I observe higher morale in similar work groups when a group includes employees as advisors as they develop and update practices, policies, and organizational changes. When it is top-down management without employee representation, work groups look for and castigate changes that result in unexpected malfunctions. When a representational employee is allowed to participate in the policies, practices and changes, employees have a sense of trust in the outcomes. It is my observation that they have more patience with the changes. I wonder if poor managers have an innate need to hold the ultimate power while good managers are truly willing to share that power with interested management parties.